IT’S ALL ABOUT THE COMFORT Put comfort first this spring with our collection of premium products. Give your feet a luxurious treat with our Cape Mohair® Medi Socks in new Natural (pg17), enjoy 24-hour relief from pain with our new Plantar Fasciitis Compression Sleeves (pg46) and get the barefoot look with our ultra-comfy Seam-free Foot Socks (pg24). Plus, improve your underfoot comfort with our collection of specialist insoles. P.S. Get your feet sandal-ready with our fabulous Simply Feet Foot Cream (pg51). NO QUIBBLE MONEY BACK GUARANTEE If you are not 100% satisfied with a product, for any reason, at any time, return it to us FREE for an immediate exchange or refund of the cost of the product. Full information on page 63. Some of our electrical and mobility products are covered by a separate 1 Year No Quibble Money Back Guarantee. They also have their own manufacturer’s warranty. Most socks and hosiery are available in our fitting. Look out for our diabetic-friendly logo. Products marked with this are suitable for people with diabetes. The most comfortable socks you’ll ever wear! COS Y F EE T SOCK S COME W IT H A WA R NING. ONCE YOU’ V E T R IED T H EM , YOU WON ’ T WA NT T O W E A R A N Y T HING EL SE! Crafted from high-quality yarns and made to last, we guarantee your feet will love them. In fact, if they’re not the most comfortable, best-fitting socks you’ve ever worn, you can return them for free at any time and get your money back. FI T T I N G Most Cosyfeet socks are available in our exclusive, extra roomy fitting. Made with more material in the foot and leg area, they fit swollen legs in comfort and are easy to get on and off a swollen foot. If you’re fed up with socks that leave nasty marks, you’ll love our exclusive Softhold® socks. The special ribbed design holds them up securely but gently, so they don’t cut in or restrict your circulation. S E A M - FR EE Ideal if you have diabetes, sensitive feet or you just want to feel really comfy. These socks have a smooth join at the toe that won’t rub or irritate and are designed to stay up without cutting in or restricting circulation. Most of our socks are made in England by a family-owned business. While many have turned to cheap, low-quality alternatives, our suppliers use premium yarns and time-honoured techniques to create beautiful, quality socks. Our cotton-rich socks are a pleasure to wear and last a long time. That’s because we use combed cotton which is beautifully soft and strong. By investing in a high-quality yarn, you get a superior sock that won’t pill and keeps its shape and softness after washing. This is a beautifully-comfy, lightweight sock. Thanks to the Softhold® top, it won't cut in, restrict circulation or leave nasty marks. It’s super-soft against your skin and the underfoot ventilation panel keeps feet cool and dry. It’s hard-wearing, due to the nylon and stretchy for added comfort. Our extra roomy option is ideal for swollen legs. Cotton-rich Mid-weight Seam-free Great with jeans and casual wear, this soft, ultra-comfy sock keeps feet cool and dry. The Softhold® top won’t cut in or restrict your circulation while the smooth join at the toe won’t rub or irritate. Our extra roomy option is ideal for swollen legs. Very comfortable and roomy. I would buy again and recommend. Merino Wool Forget itchy, heavy wool! Our fabulous Merino socks are soft and lightweight. Naturally cool in summer and warm in winter, they have excellent wicking to keep feet dry and are breathable and anti-microbial. Your feet will love them! Wool-rich This soft, lightweight sock is one of our favourites. Made from super-fine Merino wool, it's warm without being bulky so it won’t take up room in your shoes. It’s stretchy for a comfy fit and the Softhold® top won’t cut in or leave marks. Our extra roomy option is ideal for swollen legs. Wool-rich Seam-free Cushioned Sole This is a fantastic sock if you have diabetes or sensitive feet. It's gently cushioned on the sole, toe and heel for added protection and the smooth join at the toe won't rub or irritate. Made from soft, warm, lightweight Merino wool, the Softhold® top won't dig in so all you feel is blissful comfort. Our extra roomy option is ideal for swollen legs. Amazing quality true to reviews. Really warm and comfortable socks that wash very well too. Thermal Made from a high percentage of Merino wool these snuggly socks are thicker than our wool-rich socks and will keep toes toasty. The Softhold® top won’t dig in and the stretchy LYCRA® fibre enhances the fit and comfort. Our extra roomy option is ideal for swollen legs. Thermal Seam-free Knee High If you suffer from cold feet and legs, then this cosy sock is the one for you! With added warmth from the soft, heavier-gauge wool, it comes up to the knee so it’s perfect for colder days. The smooth join — at the toe is kind to tender feet and the Softhold® top won’t dig in so it’s exceptionally comfy to wear. Our extra roomy option is ideal for swollen legs. This amazing, super-stretchy sock is ideal if you have large or swollen legs, oedema (fluid retention) or lymphoedema. Soft and exceptionally comfy, the special ribbed construction holds it up securely without digging in, causing pressure or restricting your circulation. It also has a smooth join at the toe which won’t rub or irritate the most tender toes and skin. This purchase was for my mother who says they are the softest, most comfortable socks she has ever had. We love this sock! It’s luxuriously soft, thanks to a blend of fine-knit bamboo and silky mohair, but still strong and hard-wearing. Lightweight and breathable, it keeps you cool in summer and warm in winter. It also resists foot odour and wicks away moisture, keeping feet fresh and dry. It’s cushioned at the heel, for extra comfort, so it’s ideal if you’re sensitive underfoot. Naturally stretchy, it won't restrict your circulation, and the external toe seam means there's nothing to rub tender feet. Bedtime bliss Super-soft Bed Socks Enjoy a comfy and cosy night’s sleep. Ideal for anyone with poor circulation, these snuggly socks keep the coldest feet warm. The brushed yarn is luxuriously soft while the loose top around the ankle offers extra comfort. Our extra roomy option is a great fit for swollen feet and legs. Just what I’ve been looking for. Bed socks that are not tight around the ankle. Gripped Socks Our super-comfy gripped socks are perfect for padding around the house or snuggling on the sofa. With slip-resistant tread and a sumptuously-soft terrycloth lining these socks are perfect for keeping feet cosy and warm. There’s nothing to rub or irritate, thanks to the smooth join at the toe, and the loose top around the ankle offers extra comfort. Very comfortable and warm with anti-slip protection. Anti-DVT Travel These socks are a must if you’re travelling or sitting still for long periods. The graduated compression helps maintain regular blood flow and can reduce the risk of deep vein thrombosis (DVT). It can also help prevent swollen ankles and provide relief from tired, aching legs. Our extra roomy version is specially designed to fit swollen ankles. Please Note: Unsuitable if you have previously suffered from blood clots, undergone recent surgery, have DVT, cellulitis, arterial disease, circulatory problems or diabetes. If you have swelling, please check with a health care professional before wearing. Not suitable for very swollen legs. Excellent quality, good colour range. Very snug without being overly tight. If you have diabetes, vascular disorders or circulatory problems, it’s important to wear the right sock. This one is specially formulated to protect vulnerable feet against irritation, chafing or pressure which can cause sores and ulcers. Soft and exceptionally comfy, it’s made from the finest combed cotton to keep feet dry and prevent skin infections. Ultra-comfy hosiery for every shape & size W E’ R E ON A MIS SION T O BR ING YOU T H E MOS T COMF OR TA BLE HOSIERY YOU’ LL EV ER W E A R ! Hosiery that doesn’t cut off your circulation, won’t sag or fall down and is long enough in the legs and roomy enough in the thighs and waist. Made in Britain, exclusively for Cosyfeet, our hosiery is designed to fit you perfectly - whatever your shape or size. And if it doesn’t, just return it at any time and we’ll give you your money back. Designed to fit you perfectly FI T T I N G Designed for people under 160cm (5'3") in height. See pages 31 & 33. FI T T I N G Our extra roomy hosiery is made on larger cylinders using more material so it’s roomy throughout. This gives an exceptionally generous and comfortable fit and is ideal if you have swollen or shapelier legs. Traditional hosiery can sometimes feel tight or dig in. Our ultra-comfy Softhold® hosiery stays up gently but securely without pinching, cutting in or restricting your circulation. X X XL ARGE TIGHTS Our Everyday Tights are available in XXXLarge which fits hips up to 229cm (90"). See page 33. Our hosiery is made in Britain. Seam-free Foot Socks Our premium foot socks hide discreetly in your footwear to give you a barefoot look. Seam-free and super-soft, they’re a pleasure to wear, especially if your feet are sensitive. They’re also cotton-rich to keep feet cool. The patented ‘comfort band’ keeps them on securely without digging in for an exceptionally comfy fit. Our extra roomy version is perfect if you have swollen feet. Premium Ankle Highs When we say these are the comfiest ankle highs we’ve ever tried, we’re not exaggerating! They don’t dig in or restrict circulation thanks to our Softhold® top that holds them gently but firmly in place. Soft but hard-wearing, the added LYCRA® fibre ensures comfort, freedom of movement and a superb fit. And with 6 in a pack, they’re great value for money. Our extra roomy version is perfect for swollen feet and ankles. Ultra-roomy Knee Highs These are the roomiest knee highs in our range. Designed to fit very large or swollen legs, they're ideal if you have oedema (fluid retention) or lymphoedema. Made from a soft, high-quality knit, they're exceptionally comfy and very stretchy so you’ll find them easier to put on. A pleasure to wear all day, they won’t sag or fall down thanks to the comfort band that holds them gently but firmly in place. We love these premium-quality knee highs! A joy to wear, they feel wonderfully soft and smooth and have an elegant, silky sheen finish. Our 40 denier option, with LYCRA® fibre for improved comfort and fit, is semi-opaque but still gives good leg coverage and is strong and long-lasting. Its lightweight qualities are ideal for milder weather. Our 80 denier option, with 3D technology by LYCRA® is remarkably stretchy giving you greater freedom of movement along with enhanced comfort and fit. Ideal for swollen legs, these hard-wearing knee highs are roomier throughout, giving you an exceptionally generous and comfy fit. The wide band provides extra comfort and won't cut into swollen legs. Premium Knee Highs The Softhold® top holds them gently but firmly in place without digging in or restricting your circulation. Stretchy LYCRA® fibre gives you freedom of movement and an improved fit. Light Support Knee Highs Featuring LEG CARE technology by LYCRA® brand, which provides a gentle, graduated massage action that’s clinically proven to improve circulation and reduce leg fatigue. The Softhold® top ensures they stay up comfortably without digging in. Warm Ribbed Knee Highs Knitted from SUPPLEX®, a clever fibre that keeps legs warm but still lets skin breathe. Ultra-comfy and stretchy throughout for a beautiful fit, they’re soft, durable and wash well. Everyday Stockings Unlike ordinary stockings, these are made on a larger cylinder using lots more material in the feet and legs. This means they’re much roomier throughout, giving you an exceptionally generous and comfy fit for swollen or shapelier legs. It also makes them easier to put on. They have a wide band at the top for extra comfort and feature a run-resistant knit so they offer great value for money. For use with a suspender belt. Light Support Stockings These are ideal if you suffer from tired, aching legs or if you’re on your feet all day. They feature LEG CARE technology by LYCRA® brand, which provides a gentle, graduated massage action that’s clinically proven to improve circulation and reduce leg fatigue. For use with a suspender belt. Our extra roomy version is ideal for swollen or shapelier legs. Warm Ribbed Hold-ups These are great if you’re looking for a warm alternative to tights. They’re knitted from SUPPLEX®, a clever fibre that keeps legs snug and warm but still lets skin breathe. Stretchy throughout for a beautiful fit, they’re also durable and wash well. Our Softhold® top holds them gently but firmly in place without digging in or restricting circulation so all you feel is blissful comfort. The extra roomy version is ideal for swollen or shapelier legs. Lovely – soft, warm, light and stretchy. Premium Hold-ups These premium-quality hold-ups are exceptionally comfy. Our unique Softhold® top keeps them gently but firmly in place without digging in or restricting circulation so all you feel is blissful comfort. They’re sumptuously soft with stretchy LYCRA® fibre, that lets you move freely and enhances the comfort and fit. Our extra roomy version is perfect for swollen or shapelier legs. Opaque Tights Wonderfully soft and smooth, they’re comfy to wear all day and have an elegant, silky sheen finish. Our 40 denier option, with LYCRA® fibre, is semi-opaque but still gives good leg coverage and is strong and long-lasting. Its lighter qualities are ideal for milder weather. Our 80 denier option, with 3D technology by LYCRA®, is remarkably stretchy giving you greater freedom of movement along with enhanced comfort and fit. WHAT S I ZE T I GH T S SH O U L D I O R D E R ? If you have swollen or shapelier legs we recommend our fitting. Otherwise choose our standard fitting. You will also need to choose your size according to your hip or dress size. half back panel gusset. XXLarge has a full back panel gusset which allows more room and enhances the comfort and fit. Everyday Tights Made on a larger cylinder than standard hosiery, these run-resistant tights are roomier throughout. This means they’re long enough in the leg and big enough around the thighs and waist, providing an exceptionally generous and comfy fit. Ideal for those 160cm (5'3") or under in height. which fits hips up to 229cm (90") in Natural & Black only. XXXLarge has a full back panel gusset. Light Support Tights Featuring LEG CARE Technology by LYCRA® brand, which provides a gentle, graduated massage action that’s clinically proven to improve circulation and reduce leg fatigue. They also feature a deeper-than-average waistband for an all-day comfort fit. Warm Ribbed Tights Knitted from SUPPLEX®, a clever fibre that keeps legs warm but still lets skin breathe. Stretchy throughout for a beautiful fit, the deeper-than-average waistband provides extra comfort. Don’t let painful feet slow you down! Selected from the world’s leading manufacturers, our tried and tested products can help you with a range of conditions and needs. THE SM A RTER WAY TO R ELIEV E PA IN & ENJOY COMFORT Our high-performance SmartGel™ Technology products are recommended by podiatrists to combat foot problems such as sore toes, sensitive heels and painful bunions. The specially-formulated gel acts as a shock-absorbing cushion which absorbs pressure and reduces friction, so you can walk in comfort again. Gel Forefoot Protector Ideal if your toes or ball of foot are sore or sensitive. The covered layer of gel cushions and protects them from any painful pressure or friction. Also stops twisted or mis-shapen toes from rubbing on the tops of your shoes. Lightweight, discreet and slim, they fit into most footwear. Not suitable for swollen feet. Get instant relief from ball of foot pain and pressure. A layer of superior cushioning gel is enclosed in a soft, stretchy fabric that fits gently and securely over your foot and is held comfortably in place with 2 toe loops. Not suitable for very swollen feet. All Gel Toe/Finger Caps Ease painful pressure and friction on your toes and fingers. Protective and cushioning, they relieve corns, calluses, damaged nails and cuticles, hammer toes and partially amputated digits. Self-adhesive Gel Sheets with Anti-microbial Top Cover These self-adhesive, cushioning gel sheets can be cut to size and used anywhere on the body to relieve friction or pressure. Ideal for blisters, corns, calluses or delicate skin. Soft, 4-way stretch for comfort. Straighten crooked, overlapping or deformed toes. Shaped for comfort, the protective, cushioning gel moulds to all toe shapes and sizes while the soft, toe loop keeps the spacer in the perfect position. Fits comfortably into most footwear. Straighten overlapping toes to stop them from rubbing and relieve pressure from the bunion joint. The loop holds them gently but firmly in place so they’re ideal for bare feet. Ease in-between toe pain caused by blisters, corns and rubbing nails. These soft, flexible gel pads align toes and keep them comfortably apart. Straighten overlapping toes and relieve painful pressure from a bunion. These soft, flexible gel pads are cushioned and shock-absorbing and fit comfortably between your toes. Perfect for toe pain, overlapping toes, bunions and forefoot pain. Helps relieve tension and improve circulation. Not suitable for use with shoes. Suitable for corns, calluses, blisters, abrasions or sore toes. These stretchy, gel-filled, non-fraying tubes can be cut to the length required. Bring fast relief to cuts, grazes, bruises, corns or sensitive skin. Simply cut the soft, breathable foam to size and slip over the affected toe area for instant protection. 90cm (36") roll. Suitable for blisters, corns, calluses or hammer toes. These soft, stretchy sleeves contain a protective pad of hypoallergenic, vitamin-enriched gel. Protect and relieve pressure on bunions while gently re-aligning overlapping toes. The soft, cushioning gel fits comfortably between your toes. This soft, flexible gel guard cushions and comforts the tender bunion area giving welcome relief from pressure and rubbing. Fits comfortably and securely over the big toe. These self-adhesive, super-soft gel covers comfort and protect painful bunions giving immediate relief. Slim and discreet, they move with your foot and reduce friction between your shoes and skin. Fit into most footwear. The gel tack comes back after each wash.
NatraCure® Gel Fitted Achilles Heel Sleeve Adjust-a-Lift Heel Cushion Relieve pump bumps (Haglund’s deformity) or sore or injured Achilles tendons. The cushioning, gel pad protects your heel from friction and pressure and releases mineral oil to soften skin. The sock-shaped sleeve offers gentle compression. Made from bamboo fibres which wick away moisture. Ideal for boots or braces. Fits right or left foot. For leg length discrepancy, heel spurs or raising your foot in a high cut shoe. The cushioning lift has 3 layers of 3mm neoprene covered with suede. Adjust from 9mm to 3mm by peeling off a layer at a time. Want more comfort or relief from pain? Find out how our insoles can help Whether it’s to relieve pain, prevent foot problems or improve your comfort, you’ll find an insole to suit your needs. Tired feet and legs? Aching back? Headache? Prevent these symptoms of ‘step-shock’ caused by shock waves travelling through your feet, legs and spine. With exceptional shock-absorbing properties, the bouncy, cushioning material helps protect your joints and muscles and fight fatigue. Durable for long-lasting comfort, CosyCushion™ is also breathable and anti-bacterial to help keep feet healthy, comfy and dry. £9.50 Microporous cell structure acts like a million tiny springs! Help relieve pain and increase comfort by protecting and cushioning the ball of foot area. These ¾ length insoles are designed to give superior comfort and gentle support for weak or fallen arches. Developed by a renowned podiatrist, Vionic gives you a cost-effective alternative to custom-made orthotics. They re-align your feet and lower body and reduce overpronation (where your foot rolls in too much). This, in turn, gives relief from plantar fasciitis, heel pain, knee pain, lower back pain and aching legs so you can walk in comfort again. Ease heel pain with our superior shock-absorbing gel wedges. They absorb impact while retaining their shape and have a removable spur plug for heel spur relief. Anti-microbial cover absorbs odour and prevents bacterial growth. Copper Support Therapy These elasticised Sabona supports have copper thread knitted into the fabric which heats quickly due to its conductive nature. The fabric then retains the heat around the damaged joint or limb creating warmth which aids quicker recovery. The elasticity creates compression, increasing blood flow to the area, which also helps prompt a speedy recovery. Not suitable for very swollen feet and legs. The Original Copper Heeler®™ Ease arthritis and joint pain with these copper insoles, developed by top orthopaedic technicians. Copper is absorbed through the skin and circulated round the body to help ease rheumatic aches and pains, even when you’re wearing socks and hosiery. Pure Rosemary Oil Add a few drops to your bath to relieve congestion or aches and pains. Use it in an oil burner to relieve stress, boost mental activity and enhance memory. Or add a few drops to your hairbrush to encourage hair growth. 25ml. Infused with soothing essential oils, this fine mist will help you relax and unwind at bedtime. Lightly spray onto your pillow and let the calming fragrance lull you into a restful night’s sleep. 150ml. Healing Lavender Lavender is well known for its lovely fragrance but it also has many health benefits. It can relieve anxiety and insomnia, ease muscular aches and pains and enhance blood circulation. It’s also a powerful antiseptic and anti-inflammatory. 1. Lavender Body Powder 350gm. This sweet-smelling moisturising cream is easily-absorbed and has the added benefits of Aloe vera, shea butter, sweet almond oil and vitamin E, leaving your skin feeling soft and nourished. 50ml. This easily-absorbed lotion is beautifully scented with rose flower extract. It helps tone your skin, removes dryness and gives it a healthy, even glow. 150ml. Celadrin Forte® is a safe and natural anti-inflammatory, clinically proven to alleviate arthritis, aching joints and injuries to muscles and tendons. The balm is rapidly absorbed and provides immediate and cumulative pain relief. The capsules work in a similar but more dramatic way to fish oil and can also promote joint health and improve flexibility. For even greater effectiveness, use both products together. Botanical Foot Soak This luxurious foot soak soothes tired or painful feet. Contains B5, to moisturise and soften, tea tree oil for its antiseptic properties, lavender oil to cleanse and geranium oil to soothe skin. 250ml. ClearZal® Hard Skin Remover Clinically proven, intensive cream for the removal of hard skin and calluses. Allows healthy skin to grow. 100g. ClearZal® Exfoliating Scrub Packed with high-quality, natural ingredients this silky scrub uses tiny particles of pumice to gently exfoliate dead skin from your feet and legs, leaving them soft and smooth. Contains Aloe vera, essential oils and vitamins to cleanse, condition and nourish. 100g. Soothe sensitive, irritated or allergy-prone skin. Easily absorbed, it contains manuka essential oil which helps stabilise, heal and rejuvenate skin. No added colour or fragrance. 50ml. 2. Manuka & Mint Foot Balm This easily absorbed and refreshing foot balm provides potent anti-microbial and anti-bacterial properties along with the soothing qualities of peppermint. Paraben and SLS free. 150ml. 3. Foot Cream Treats dry and callused skin. Olive oil and 10% urea rehydrate while papaya helps skin recover and regain strength. Non-greasy, mint scented. Perfume and paraben free. 175ml. 4. Heel Balm Extremely effective in treating rough, dry and cracked heels. Contains 25% urea, the skin’s own moisturiser and is lightly scented with mint. Perfume and paraben free. 120g. 5. Foot Rasp This extra-large, double-sided foot file easily removes dry skin on the bottom of your feet leaving them soft and smooth. 23.5cm x 6cm (9¼” x 2½”). 6. Professional Nail Clippers & File Set These professional products come in an attractive, Cosyfeet branded velvet pouch. Toe Cleaner This long-handled, lightweight sponge can be used in the bath or shower to clean feet and toes effortlessly and without bending. Overall length 62cm (24½"). ClearZal® BAC for Infected Nails Kills 99.9% of fungus, bacteria and viruses that cause infections under toenails and surrounding skin. Contains Aloe vera. Alcohol free. 30ml. This lightweight, long-handled sponge makes it easier to wash your legs in the bath or shower. The soft cleaning sponge has a gentle exfoliating pad on the reverse side. Overall length 63.5cm (25"). Ergonomically designed to make nail cutting easier, these special scissors are long-handled to avoid awkward reaching, and have an extra large lower hand loop for better grip. Softens up even the toughest toenails to make cutting easier. 28g. Ideal if you have difficulty putting on socks or stockings. Can also be used as a carer’s aid. 21cm x 18cm x 14cm (8¼" x 7" x 5½"). Suitable for most kinds of compression hose, simply stretch the stocking over the frame and slide it smoothly up your leg. 36.5cm x 22cm x 24cm (14½" x 8½" x 9½"). Ideal if bending or reaching for things is difficult. Lightweight and sturdy, it has a simple trigger action, handy magnet and rubber-lined jaw that securely grips the slippiest of items. Put your socks on more easily. Simply stretch the sock over the Sock Aid then use the reins to guide your foot in and pull the sock up your leg. This long-handled, lightweight gripper has a rotating head with soft rubber tips to help you remove socks or pick up out-of-reach objects. Overall length 81cm (32"). These have been a great success with helping to improve leg circulation. Enjoy comfort and support for your legs, knees, neck or back with these multi-use, foam wedges. Use singly or together to provide comfortably firm support and ease aches and pains. Ideal for raising your feet in bed to reduce swelling and improve leg circulation. Cotton covers are removable and machine-washable. Fire retardant. Excellent product. My grandad has sore feet and the cradle stops the sheet from causing him pain. A lightweight, easy and effective way to prevent uncomfortable pressure on sensitive feet and legs in bed. It keeps sheets and heavy blankets from touching or rubbing bandaged, irritated or damaged skin and lets you move freely and comfortably. It’s useful for people who are in bed for extended periods as it also helps to promote air circulation. Fits neatly onto end of mattress. Waist size adjusts from 55.88 – 139.7cm (22" – 55"). BioFeedbac™ Belt Extender (12") You can purchase the belt extender to fit a 139.7 – 170.18cm (55" – 67") waist. BioFeedbac™ Knee Support Combat muscle and joint pain with this innovative product. Developed by the world’s leading back doctor, the patented BioFeedbac™ technology re-educates muscle tissue and is proven to: Prevent muscle damage Reduce muscle tension Reduce inflammation from injury or sports damage Infused with copper for unique anti-microbial wicking action, it keeps skin fresh and dry. Wear discreetly under loose clothing. Slim, very lightweight and totally supportive. With an adjustable touch-fastening, it takes just seconds to put on. One size fits all Fits up to 56cm (22") circumference. This exceptionally comfy foot stool is specially designed to reduce pressure on your legs and encourage healthy blood flow. It’s adjustable in height and automatically tilts to a comfortable angle, completely supporting your lower legs and feet. It’s surprisingly lightweight so it’s easy to carry from room to room and the soft, foam cushion is covered with an attractive, leather-look fabric that can be wiped clean. Our exclusive version is ideal if you have larger legs or just like to stretch out. Lambs Wool Pile Cover Relieve pressure on sensitive legs and feet with this sumptuous cover. Removable and washable. If you have a chronic illness or a disability you may be eligible for VAT Relief on this product. See page 63 for more details. Ideal if you find it difficult to grip a standard cane. The orthopaedic handle is specially shaped to fit the contours of your hand, providing comfort and support. Made from strong but lightweight aluminium it has a sturdy, non-slip rubber ferrule for extra stability. State right or left-handed option when ordering. Stop uncomfortable jarring when you walk. This unisex cane has a shock-absorbing spring to prevent your wrist and elbows from taking the impact. It also protects your arm and leg muscles from strain. Painful, aching legs & feet? It could be due to Poor Circulation Good circulation is essential for good health but certain medical conditions, age and even just being less active, can all cause circulation problems. The result: aches and pains in your legs and feet that impact every day life. REVITIVE Medic Circulation Booster is a drug-free medical device that uses clinically-tested Electrical Muscle Stimulation to get your lower leg muscles pumping - actively improving circulation, relieving aches and pains. Use daily to feel the full benefit. A typical session lasts 20-30 minutes. Improve circulation	Relieve aching legs and feet Reduce swollen feet and ankles Strengthen leg muscles UNSUITABLE IF YOU ARE: fitted with a heart pacemaker or AICD; being treated for, or have the symptoms of, an existing Deep Vein Thrombosis (DVT) or you are pregnant. Always read the manual. Use only as directed. £249.99 £208.33 without VAT RRP £299.99 - saving £50 You may be eligible for VAT Relief on this product. See page 63 for more details. Keep swollen feet cool Keep feet cool on warmer days. This soft, cotton-mix slipper works equally well as a sandal thanks to the flexible rubber soles. The adjustable straps open right out so it’s ideal for very swollen or bandaged feet. Consumer Contracts Regulations 2014 – Order Cancellation Under the Consumer Contracts Regulations you are entitled to cancel your order if you wish, provided that you exercise your right no longer than 14 days after the day on which you receive the products. Cancellations under the regulations will result in a full refund including our standard delivery costs. For full Terms and Conditions visit our website or call us. The paper in this catalogue originates from timber that is sourced from responsibly managed forests, according to strict environmental, social, and economic standards. The manufacturing mill has both FSC & PEFC certification, and also ISO9001 and ISO14001 accreditation. When you have finished with this catalogue please recycle it. If you have a credit or debit card you can order by phone. Individuals who are chronically sick or disabled can claim VAT Relief on Cosyfeet Extra Roomy Footwear and products showing ‘without VAT’ prices. 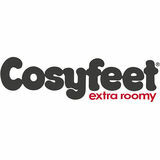 You can buy Cosyfeet products at any time from our easy to use online shop. If you wish to pay by credit or debit card, please tick the relevant box on the order form and a customer advisor will call you to take payment. UK DELIVERY Providing it’s in stock, you should receive your order within 1 – 4 working days from despatch. We also offer a Guaranteed Next Day Delivery Service for an additional cost if you order by 2pm Monday – Thursday. Please call or go online for details. We don’t despatch at weekends or on public holidays. For details of overseas delivery please see our website. If you want to return or exchange a product we offer FREE UK returns via the Post Office. Visit cosyfeet.com/returns for more information. Alternatively, we can arrange for goods to be collected from your home by Parcelforce at a cost of £8.50. Please call for details. •	Or are terminally ill If you are unsure, please ask your medical advisor, as we are unable to give medical opinions. If you qualify and want to claim VAT Relief on your first purchase, you must order by post or online or visit our shop in Street. We are unable to accept your first VAT Relief Claim over the phone. If posting your order please ensure that you complete the VAT Relief section on the order form with your signature (or that of someone who can sign for you). If you are ordering online please fill out the online VAT Relief section when ordering. Once we receive your form we’ll register you so that you can place subsequent orders by phone. You’ll need to renew your registration every three years. Because we are continually improving and developing our range there may be some slight variations to the specifications and colours shown in this catalogue. Cosyfeet reserve the right to withdraw or alter the specification or price of a product without prior notification. Coolmax® Seam-free These stretchy, lightweight socks use Coolmax® technology to keep feet fresh, dry and healthy. The clever fabric improves breathability and moves moisture away from the foot, so it evaporates quickly. This helps prevent odour and reduces the risk of athlete’s foot, sores and blisters and keeps feet at a comfortable temperature. The soft cuff gently grips the leg while the smooth join at the toe adds to the overall comfort. Ideal for walking, exercise or feet with a tendency to sweat.